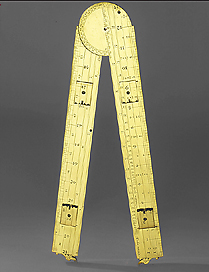 This extremely accurate instrument is made up of flattened legs, marked with various inscriptions. By means of the scales inscribed on one face it is possible to calculate areas and volumes of timber used in construction. The markings on the other face of the instrument allow bearings to be taken. Each leg is provided with two folding sights which allow the instrument to be used for observations. The instrument is signed by Humfrey Cole, a map engraver and instrument maker in London.